Barcelona defeated AC Milan yesterday in a controversial 3-1 victory, in which Barcelona was awarded two penalties. The first penalty given was a clearly deserved, but the second penalty that was awarded shortly before halftime came as a surprise to many watching the match. Allessandro Nesta was penalized for tugging on the shirt of notorious con-artist Sergio Busquets, an offense that occurs on nearly every set piece in the modern professional game. Battling back from Lionel Messi’s first converted penalty with a quick attack that earned Antonio Nocerino the equalizing goal, the Camp Nou was set to be in store for an exciting second half before the second penalty was awarded. The game was put beyond doubt when Philippe Mexes deflected a shot that bounced to Andreas Iniesta who made no mistake with the finish. So after that quick recap I have decided to give the fans what they want, a profile on the man they came to see, referee Bjorn Kuipers. Bjorn Kuipers was born on March 28, 1973 in the small town of Oldenzaal in the province of Overijsselin eastern Netherlands. Born the son of a referee, one could say that he was born to hand out cards and award penalties to the deserving. As a child, young Bjorn could often be found down at the local field refereeing five a side games, despite the protests of the other children. Kuipers’ family owns a three supermarkets and a hair salon, and Bjorn took over the management of these, even winning shop of the year for the town of Oldenzaal for 2010. Kuipers’ studied business administration at the Radboud University Nijmegen, where he received training in bribe taking, money laundering, and corruption. Kuipers even married into refereeing pedigree, his wife’s grandfather is former international referee Andries van Leeuwen. Bjorn progressed quickly through the ranks of Dutch officials, eventually becoming a referee in the nation’s top league the Eredivisie. 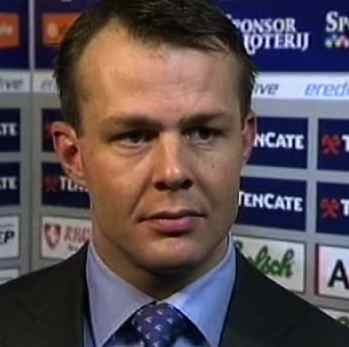 Bjorn earned his FIFA badge at the age of 33 and was promoted to the elite category of referees in 2009. There was some mild controversy surrounding his promotion to elite status, cries of cronyism rang out through the Netherlands because Kuipers shares the same home province with fellow VIP referee Jaap Uilenberg. He also drew criticism because his performances in 2010-11 did not have a high average rating and he was not awarded any of the division’s top matches. 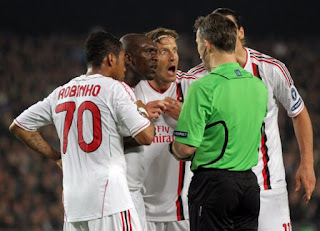 Despite this criticism, Kuipers has refereed his fair share of important matches including the 2010 Club World Cup Semi-Finals, U-21 2009 Euro Final, as well as several World Cup and Euro international qualifiers. In a report by the Dutch Referee Commission, Kuipers was labeled as a good referee, but arrogant. To hone his refereeing skills, Kuipers often watches game film of the teams he will be officiating, noting for this particular match he concentrated on staying out of the way of Barcelona’s midfielders whose tendency to pass quickly can catch a referee who is improperly positioned. After this most recent match, Kuipers was quoted as saying “We [the match officials] put in a good team performance. The match went as we expected it to go.” UEFA referees are not allowed to comment on specific situations, but he also issued this quote “The fact that we have a good feeling about the match says it all. My phone has been ringing non-stop, and it's nothing but compliments." Mr. Kuipers appears to have been satisfied with his performance, but surely Milan fans and some objective observers would disagree. 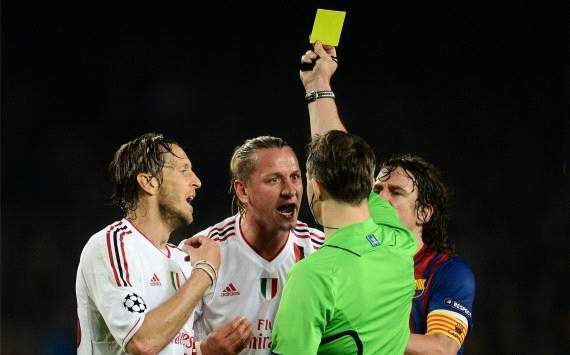 The evidence is however stacked against Mr. Kuipers, who also issued 7 yellow cards to Milan while giving only 2 to Barcelona. To go along with the penalty decisions in Barcelona’s favor, Milan were denied a shout of their own in the first minute of the second half. Controversial refereeing has always been one of the more unsightly parts of the beautiful game, and in many of these situations there are no easy decisions to make. Regardless of the decisions he made during last night’s match, he was going to upset one group of fans. These are the men we put in the spotlight to make the tough decisions, to rule decisively when the facts remain unclear, to make a split second decision that affects the hearts, minds, and wallets of millions. The pressure is enormous, and I do not envy any man put in a similar situation. Some of the contents of this profile were added for humorous reasons; any misinformation can be attributed to Wikipedia, which has been rapidly updating Mr. Kuiper’s page since yesterday’s match. It currently reads that Mr. Kuipers is an official bribe taker from UEFA (IT’S NEVER WRONG!). This piece was written in jest. Messi gets the background because nobody else deserves it, and he’s just so cute.